Are you aiming to be successful or significant? Because we live in such a success-oriented world, when we are asked to choose between success or significance, it seems only natural to choose success. Today, success is measured in material wealth, position, status and popularity. When young, we may dream of being rich and famous. That, we think, is the road to happiness. Wouldn’t it be nice never to worry about money? You bet! Wouldn’t it be great if adoring fans mobbed us and clamoured for our attention wherever we went? Sounds tempting! How, then, do we explain the problem I encounter as I interact with executives and entrepreneurs who have achieved outstanding financial and career success, but who are actually deeply unhappy and living miserable lives? When it comes to material wealth, they have it all – one of these people was described by a colleague as “being so wealthy that his grandchildren won’t have to work.” But, in the next breath, the colleague added that this person was very unhappy. As one is confronted by story after story of people living unhappy lives in many of the mansions scattered around upmarket suburbs, it becomes clear that, contrary to popular belief, money can’t buy love (Jim Carrey will vouch for that) and it can’t buy happiness (maybe Britney Spears could say, “Amen” to that). If we’re making a mistake chasing success, what then should we be doing? What is the point of all the hard work and sacrifice we put in every day? It’s important to note that there is absolutely nothing wrong with being financially comfortable or wealthy. Some believe that it is a sin to be wealthy and that purity and goodness can only be achieved by living a life of poverty and deprivation. Rubbish! While it may be more blessed to give than to receive, if you don’t have anything to give, there’s not much fun in giving. It’s admirable to work towards financial success, BUT … if that’s all you’re aiming at, you’re setting yourself up for a life of emptiness while you sit on your comfortable upmarket furniture and drive your luxury car. Every human being craves to be significant. We all have a desire to make some impact on the world in which we live and on the people with whom we interact. When young, we may be less concerned about significance – we’re in success mode. But if we chase success at the cost of everything else, we find an emptiness growing inside ourselves that we just can‘t fill. And because we don’t understand the “Law of Enough”, we end up chasing the ever-moving target of financial wealth that will torment us no matter how long and how hard we run after it. That’s because some people incorrectly believe that they need to become MORE financially successful to fill the emptiness. Understand this: money can buy comfort and convenience, but it can’t fill a heart. Only meaning can do that. Significance is therefore achieved by helping others not as fortunate as yourself in several ways. If you’re able, you could make regular financial contributions to a worthy cause or give of your time to help such a cause. You could also donate your skills and expertise to assist in an area of need (helping with the selection and recruitment of suitable workers or doing books and managing finances). 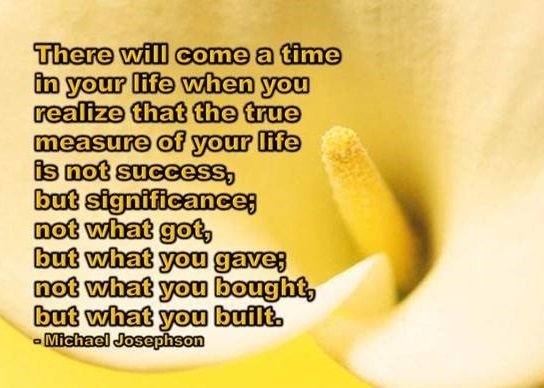 Think about what you could do to achieve significance. The world needs your unique personality, talents, gifts and skills. Don’t limit them to the walls of your workplace. Don’t put a price on them when it comes to achieving significance. Aim for success, but also strive to be significant. You will achieve a far greater sense of fulfilment and will leave the world a better place. Alan Hosking is the Publisher of HR Future magazine, www.hrfuture.net, @HRFuturemag. He is a recognised authority on leadership skills for the future and helps business leaders learn to lead with purpose and agility. Do you have the courage to learn new things? I have noticed an interesting phenomenon, having helped business leaders prepare for the future of work for the past 17 years: when they are faced with having to learn something new, some of them don’t have the courage to do so. It’s as simple as that. They don’t admit to themselves, let alone anybody else, that they don’t know something. And a basic requirement of learning anything is acknowledging that you don’t already know it. After all, if you kid yourself that you know everything, why should you have to learn something you already know? This is one of the reasons why we battle with change. After all, our knowledge is what got us to where we are, so it must surely be good enough to get us to where we still want to go. See your learning like this: treat everything you learn as the foundation for all new knowledge you learn along the road of life. In other words, the knowledge you acquire along the road of life simply serves as the base – the foundation – on which you build all other learning. And while you’re alive, you keep building and building your knowledge. We all need to learn different things, and at different stages of our lives. The important thing, though, is that you never stop learning. Leaders who try to make it on knowledge they learned 10 years ago end up embarrassing themselves and disappointing those they lead. Why does money have so much power? As the extent of the theft of public money becomes clearer, more and more people are being exposed for what they are prepared to do, or not do, for money. Why does money have such a grip on some human beings? Since the concept of exchange of value via currency was invented, money has occupied a very powerful spot in the hearts, minds and lives of human beings. Some have lived and died never having had much of it, some have literally given their lives in the legal or illegal pursuit of it, while others have lived and died with more than they could ever have spent in their lifetime and still felt they never had enough. The reason that money holds such a power over people is that it provides them with power – to do what they want to do, whatever that may be. Some people feel money gives them a sense of personal worth. They feel if they don’t have much money, they are not worth much as a person and if they have a lot of it, they are indeed of great worth as a person. That’s why many people associate the accumulation of wealth with the accumulation of power – the more money you have, the more powerful you are. And when people have a low sense of their personal power, they have an overwhelming urge to amass large sums of money quite out of proportion to their needs. No matter how much they acquire, it’s never enough. This approach also aligns with greed. A greedy person never has enough, no matter how much he or she gets. The term “corruption” has become a regular in our daily news reports. Briefly, it refers to the fact that someone has agreed to commit some illegal or unethical act in the interests of securing a financial benefit or reward. It seems to imply that the person, once of good character, has subsequently been “corrupted”, experiencing a character failure as a result of the possibility of receiving a large sum of money. My view is that money doesn’t corrupt people. There are many honest, responsible people who have vast sums of money. There are also many honest, ethical people who have no money to speak of. Neither of these two groups is “corrupt”. That’s because money doesn’t corrupt people – it merely reveals their character. Honest, ethical people acquire money through honest and ethical means, and do honest and ethical things with that money. Dishonest, unethical people, given the opportunity, attempt to acquire money in dishonest or unethical ways and use it for dishonest purposes. The big question we have to ask ourselves is: What does money reveal about you and me? Does it show us up to be honest, ethical people, or does it show us up to be like the many who have sold their souls for many handfuls of cash? Only you know what money reveals about you. I urge you to take a stand against corruption and expose it wherever you find it raising its ugly head. Alan Hosking is the publisher of HR Future magazine, www.hrfuture.net, @HRFuturemag, and assists executives to prevent, reverse and delay ageing, and achieve self-mastery. What two things can’t you inherit? We live in a world we inherited. What we inherit starts before birth and continues through our lives. Our physical, emotional and personality characteristics are inherited from our parents. What we inherit shapes who we are, what we do and what we, in turn, leave as an inheritance for those who follow after us. We can choose to use wisely what we inherit or we can squander it. Sadly, some of those who inherit wealth they never had to work for can tend to squander that wealth on material and other things that do not increase their wealth and assets but merely erode them. A typical example of unearned wealth being squandered is wealth won through lotteries. In a way, winning the lottery is a bit like inheriting much wealth. The lottery winner and heir share in common the fact that they are suddenly given great wealth that they never worked to build. That’s why so many lottery winners end up bankrupt within five or so years after winning their wealth. While there are many things we CAN inherit, there are two things we think we can inherit … but can’t. The first thing we can’t inherit is success. Think carefully about this. We can inherit the results of someone else’s success – a successful business started and run by grandparents and/or parents. We can inherit great wealth, again from grandparents or parents, but we can’t inherit the success that built that successful business, nor can we inherit the success that created the wealth. Don’t take another person’s success for granted. By the same token, don’t take your own success for granted. Success requires, focus, determination, sacrifice and effort. And it’s not guaranteed. The second thing we can’t inherit from someone else is significance. Think about the people who have achieved significance in our own country and you will see that not many of those people have heirs who are equally significant. Again, you can only achieve significance for yourself. You can try to ride on the significance of those who have gone before you but it won’t last for long. 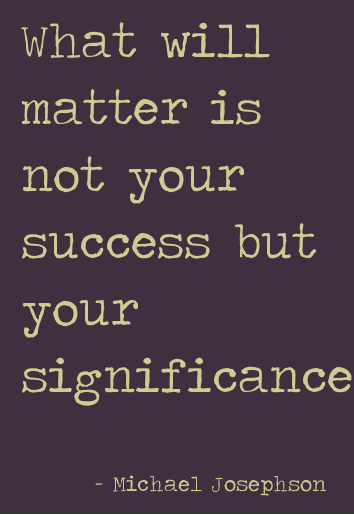 You have to find your own significance. Success is what we achieve by what we do for ourselves. Significance is what we achieve by what we do for others. Self-centred people can achieve success because they have done things for themselves but, when it comes to significance, they fail to make the grade because they don’t understand what it means to do things for others. So … if you want to achieve success and significance, you’ve got to do it for yourself. Don’t think you’re going to inherit it from a grandparent, parent, uncle, aunt, friend or boss. And while we’re talking about it, don’t stop once you’ve achieved success. If you do, you will never know true fulfilment. 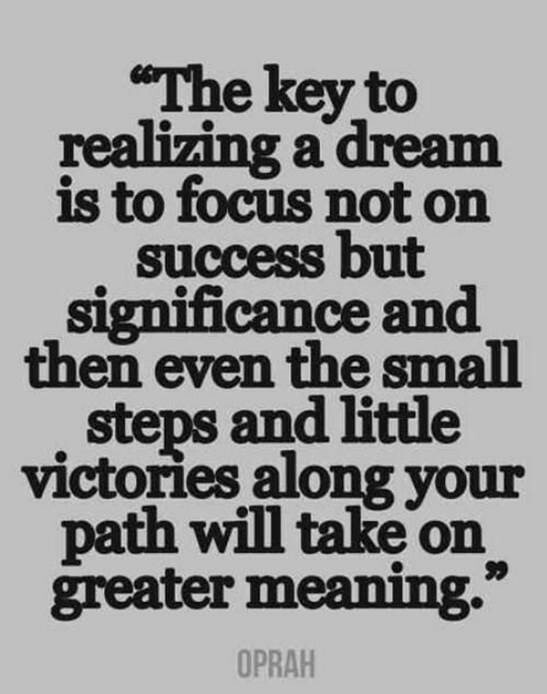 Keep going past success until you get to significance. THAT’s when you will find fulfilment! How much baggage are you carrying? Whenever I travel by air and I’ll be away from home for just one night, I travel as light as I can – one appropriately sized carry-on bag and that’s it. It’s such a pleasure arriving at one’s destination and being able to walk past the baggage carousels where your fellow travellers have to stand and wait to collect their checked in luggage. One is usually able to get to the car hire outlet ahead of the crowd and get out of the airport and on one’s way with the minimum of fuss. As an addicted people watcher, I am fascinated by the baggage other passengers carry on to planes, particularly those travellers who simply have more carry-on baggage than they can handle (despite the well-communicated baggage restrictions of the airline). Airlines generally provide for passengers to carry one bag of about seven kilograms onto the flight, as well as a handbag, laptop or briefcase. Invariably, there are passengers with all of that, and more – bottles of wine or other gifts, and a bunch of other extras, resulting in the person holding up everybody behind them as they struggle to negotiate steps and aisles, and then, wait for it, fill up the limited overhead space with all their extras, leaving the other passengers booked in their row to have to wander around until they’ve found spare space in the overhead compartments somewhere else. Of course, these passengers then have to wait for everybody else to disembark so they can proceed 10 rows back to collect their carry-on baggage where they were forced to stow it. Baggage is a necessary part of long distance travel. When you’re travelling to a destination far removed from where you are – and you’re going to stay for a period of time – you’re going to need to take some luggage, otherwise known as baggage, with you. Of course, if you’re carrying too much baggage while in transit, your mobility will be severely restricted and the simplest undertaking in terms of moving from one place to another becomes a major undertaking, not to mention the inconvenience you cause your fellow passengers. The trick is to carry only the baggage necessary for your trip and no more. That helps you to remain mobile and independent, not requiring the help of airline staff of other travellers, to get to where you want to. What kind of baggage do you carry on to a flight when you travel? Are you a light traveller or a traveller that carries too much baggage? More to the point, what kind of emotional baggage are you carrying in your life? Stop and have a look at the baggage you’re carrying at the moment. Is it necessary? Is it baggage you’ve become so used to carrying that you no longer notice it and can’t remember why you’re still carrying it – but you are. In my age management programme for senior executives, I deal mainly with leaders from 50 years and up. Many of them are carrying a tremendous amount of baggage, and they’re all united by one common fact: none of them are happy and fulfilled. If carrying baggage were to make you happy, I’d say, “Carry all the baggage you can!” But it won’t. So drop the baggage! Take a good look at how much baggage you’re carrying and make a conscious effort to drop all of the unnecessary baggage you’re carrying. That will set you free to be the person you were meant to be. Are you learning to see around corners? With the way things are changing in our VUCA world, it’s time for people who want to embrace the future effectively to look at the way they learn. Have you considered that the way we have learned for the past five thousand years or more may not be good enough to take us into an increasingly uncertain future? Ever since human beings have been learning, they have learnt in one way only – from the past. While new knowledge is discovered by people who explore and experiment, those who learn the skills the explorers and experimenters have discovered, learn what has already been established. Think about it. There was a time when certain people discovered how the laws of Nature and Science worked. Unless you and I are one of those explorers or experimenters, everything we learnt during our formative years at school, we learnt from the past – from knowledge that already existed and that had been included in our textbooks. When we were at school, our Maths, Science, Geography, English and other textbooks contained information which already existed, information from the past. I’m not saying that all past information is no longer valid although, in some cases, in the light of new information becoming available, some information does become redundant. I believe that we have to learn from the past in order to understand the future, but learning from the past is now no longer enough. Because the future is arriving at an increasing speed, the present is no longer as long as it used to be. We therefore have to make sure we learn about the future in new ways. And you don’t really learn much about the future from the past. We therefore have to learn about the future by teaching ourselves to learn from the present and from the future. Now that takes very different learning skills from what we’ve been used to until now! So how does one learn from the future? Obviously, explaining such a seismic shift in learning in a short piece like this is impossible. What I want to give you, therefore, are three tips to get you thinking in a new direction. The rest is up to you! Until recently, events happened in a linear manner. You could, for the most part, see what was coming. Now we can’t see what’s coming so we have to learn to see around the corner. You’ve heard the expression ‘connect the dots’; you now have to start connecting dots that you previously never thought of connecting. Even that’s not enough. Spotting the dots is the easy part. You now also have to start looking at the spaces in between the dots and making sense of those spaces. Now that’s something no-one has told you to do before. Broadly speaking, that refers to context. Learn to interpret context because that will give you clues as to what’s coming next. In his book Hacking Leadership, Mike Myatt says that, in order to understand the future, you must genuinely understand people. He points out that the best view of the future is found through the lens of the people. If you want to know what the workplace of the future will look like, look at the Millennials. Consider how they think and work, what motivates them and what is important to them. That will give you an understanding of what your company will look like in a few short years when they have moved into positions of influence. Not only must you learn to see around corners, but you must also learn to look at things differently and listen differently. The signs of what’s coming are actually in full view if you’re prepared to train your eye to recognise what you’re looking at. Any success or failure is not a surprise. There are very clear signs as to what is going to happen – if you know how to spot them. A number of key things happened in the run up to the Titanic hitting the iceberg in 1912, but no-one spotted them. There were a number of events that led up to the Space Shuttle Challenger disaster in 1986, but no-one spotted them. I’m not blaming anyone, I’m pointing out that, when we examine the events leading up to a success or disaster, we see that there were very clear signs indicating what was going to happen, for better or for worse, which no-one spotted. These three tips are but a few that will get you started in learning from the future. They introduce a very different style of learning from the one we’ve been used to. If you can expand your learning to include other styles rather than just learning from books and Google, you will put yourself ahead of the crowd. And when it comes to leadership, that’s where a leader should be! Alan Hosking is the publisher of HR Future magazine, www.hrfuture.net, @HRFuturemag, and a professional speaker. He assists business leaders to lead their people into the new world of work. How do you rate your accountability? Have you noticed how no-one holds themselves accountable for anything anymore? When questions get asked of people who should be accountable for some things, lips are sealed and fingers get quickly pointed – usually in the opposite direction. The fact of the matter is that, if you are in a position of power, you can’t expect accountability from anyone else until you’re prepared to hold yourself accountable for your own actions and statements. This applies to work and family life. If you’re not prepared to be accountable at work, you’re not going to be able to hold your staff accountable. If you’re not prepared to be accountable for your actions in your home, you’re not going to be able to hold your children accountable for their actions. You can try, and you can force your will on your children, but that’s a very short-term strategy and won’t last for too long. When you refuse to hold yourself accountable, you lose credibility, respect and trust. The problem is that no-one tells you this to your face so you continue to believe the lies you’ve been feeding yourself: all is fine and you’re doing an excellent job of fooling everyone. What happens when you DO hold yourself accountable? The exact opposite – people trust you, respect you and support you and you enjoy significant influence in their lives. Of course, you still need to demonstrate a high level of competence or you can hold yourself accountable until you’re blue in the face but if you’re just not cutting it, well, no-one’s going to respect you for a whole lot of different reasons. Start holding yourself accountable and you will be able to hold anyone and everyone reporting to you accountable. It’s an old fashioned thing called example. When you set an example, you can insist on everyone following it! Alan Hosking is the publisher of HR Future magazine, www.hrfuture.net, @HRFuturemag, and a professional speaker. He assists executives to prevent, reverse and delay ageing, and achieve self-mastery so that they can live and lead with greatness. How wealthy a corpse do you want to be? Few of us want to think of ourselves as corpses. After all, we spend a great deal of time, effort and money on keeping ourselves alive and in good condition! The fact is, though, that no matter how well we look after ourselves (and we should), none of us can avoid being a corpse one day. So, how about looking at what kind of a corpse we want to be. On a scale of one to 10, how wealthy a corpse do you want to be? Do you want die with all your money, gifts and qualities intact or would you like to have shared it with the world? Every responsible person should plan for two eventualities – financing their families if they die too soon and financing their own lifestyle if they live too long. The last thing you want to do is outlive your money. It’s far better for your money to outlive you! If you’re fortunate enough to have enough money to fund yourself for the next 100 years, the question becomes: how much money is enough? About 10 years ago, Bill Gates shocked the world when he said he was leaving Microsoft, and committed, with Warren Buffet, to giving away half of his wealth to charitable causes during the course of his life. He announced his intention to work for his and his wife’s Foundation to make the world a better place. All the cynics were quick to smirk that it would be easy for him to continue to eke out an existence on $30 billion (his wealth at that time was probably about $60 billion), but most missed the point – while many wealthy people are extremely charitable, just as many never give any of their money away, no matter how much they have. As far as they’re concerned, they’ll never have enough. And those are the ones who will be extremely wealthy corpses. But it’s not only their money that they take with them. They also take so many other gifts that they could have shared with the world. You might not consider yourself to be in the super wealthy category that you have to start giving half your wealth away, but look at this from a different angle … If we consider your unique gifts, skills and qualities to be your wealth, how wealthy do you want to be when you die? How many of your gifts do you want to have given away or have taken with you? Let’s face it, once you’ve passed on, your gifts and skills are of absolutely no value to you and the world any longer. So why not share them with those around you while you can? Whatever you’ve got to share, share it! If you have time, share it. If you have compassion, love, skills, talent, share them. It’s not about sharing what you don’t have, but sharing what you have. As you give away of your wealth of gifts and talents, you make the world a better place, be it for one person, 10 people, 100, 1 000 or one million people. As more of us realise that we’ve been given gifts to give away, we find fulfilment as we do what we’re meant to do. Don’t plan to take it all with you. Give away what you can while you can. There’s no fun in being a wealthy corpse! Are you a clever or wise leader? Since the dawn of time, clever people have used their intelligence to introduce many innovations that have improved the world for all of us. But, while cleverness has been what’s got us to here, it’s not enough to take us to a better reality in the next five years. The word “clever” is thought to come from a Scandinavian word meaning “skilful”. While we certainly need skilful leaders in government and business, clever people do not necessarily make the best leaders. Over the past two decades, we’ve seen what clever leaders in politics and business have done – manipulated things for their own advantage with no concern for the good and welfare of others. Clever leaders are skilful, articulate and influential, but they are not necessarily ethical, compassionate or selfless. Cleverness is amoral – it takes on the morality of the person in whose hands it finds itself. So, if a clever person is unethical, they will use their cleverness for unethical purposes. Right now, there are many very clever people in government and business. They are using their cleverness to make huge amounts of money for themselves, and are driving in luxury cars, living in luxurious mansions, eating fabulous food and feeling very proud of themselves. Wise people, on the other hand, are also intelligent. They may not have the same type of intelligence that clever people have, but they apply that intelligence only in ways that are ethical, compassionate and selfless. The difference between clever people and wise people is that wise people consider what they can do to help others while clever people think of their own interests. That’s why we admire and respect wise people. We know that they have the interests of others, and not themselves, at heart. It’s now time for us to look for wise leaders who want for others what they want for themselves, who want for other children what they want for their own children. Are you a clever or wise leader? Do you make decisions based on what you think is in the best interests of all or what you think is in your own particular interests only. Clever people have an ability to acquire, process and apply information to achieve something. Sometimes they use those skills not only for the good of others but to their own advantage. Wise people also acquire, process and apply information, but for the benefit of others. You need to decide if you want to be clever or wise. You can be clever without being wise, but you can’t be wise without being clever. If you desire to be a great leader, you have to develop and demonstrate wisdom in all you do. There can be no greatness without wisdom. Clever leaders tend to focus on their own interests. They are slaves to their greed and egos. This causes them to lead only for personal gain. Wise leaders, however, focus only on the interests of others. They are no longer slaves to their personal interests. They have risen above such things. Cleverness is a short term goal while wisdom is a long term one. No-one becomes wise overnight. It takes years of personal growth to conquer all your personal appetites and desires so you are no longer held ransom by your personal interests. Once you achieve this status, however, you will be a leader of great value to your country. What are you making in your career? Yes, those of us fortunate enough to have jobs know what it is to have to work, work, work every day. So, to provide the best possible life we can for ourselves and our children, we apply ourselves to our chosen careers or businesses with the intention to generate the necessary revenue to enjoy a good life. But what’s the real point of it all? Is it just about working to make money to pay the bills, then retiring and dying? If so, what a sad life! Look back over the past five or 10 years of your career. What have you made during that time apart from money? Have you made people happy? Uplifted anybody? Helped educate someone? Coached, nurtured, grown or encouraged anyone during your work? If so, you have made more than just money – you have a rich business, a rich, rather than poor, career. Most of us grow up with the mistaken belief that we’re in this world to GET. We don’t realise that we’ve actually been put in this world to GIVE – of what we have been given by way of the gifts, talents and skills we have. Because of this erroneous belief, we focus on what we can get instead of what we can give, not realising that it’s in giving that we receive. A simple illustration of this is a gifted singer who freely shares their gift with others by singing to large groups of people and ends up a multimillionaire. What have you got to give to others, besides the work you do for money? Do you have time, love, compassion, advice, practical help that you can offer to someone who needs it? Why not start giving of what you have? You will be amazed at the doors it opens and the opportunities it presents to you to enable you to grow yourself, your business or your career (although that’s not the reason you should be giving). When more of us start shifting from a “getting” mindset to a “giving” mindset, we’ll start changing the world for the better. And when the world changes for the better, our world changes for the better as a benefit to one becomes a benefit to all. Look at what’s happening in the world. We’ve moved from a world of thousands of years ago in which certain powerful people shamelessly exploited others for their own benefit to a co-dependent, interconnected world in which we’re all affected by what happens to others. I encourage you to start looking for ways to make more of your career, your business, your life and your family by freely giving of what you’ve been given. To those who have been taught that you have to be a jerk and good with numbers to succeed in business, this may seem counterintuitive. As you start giving of yourself, you will make more than just money and find a success and fulfilment you never anticipated!